From 2020 the Trade Show will continue as before but it will no longer be followed by a public weekend airshow. The public will, however, be admitted on the Friday of the Trade Show, which will continue to have a focus on younger people and will, the show says, be even more engaging than before. On Friday the public will also be able to visit the exhibition halls, which were previously closed over the public weekend, "to promote and inspire the next generation of pilots, engineers and innovators". On the Friday there will be a flying display, although it is not yet clear whether this will be essentially the same as on the other Trade Days or whether there will be any additional elements, as there have been on 'Futures' Fridays in earlier years. The Farnborough International Airshow is a unique event. Allowing the public to see more of the people, products and processes that underpin the global aerospace, defence and space industries will help engage and inspire a new generation. Removing the public weekend will disappoint some, but for our exhibitors and trade visitors the focus is on business and accessing the talent they need to sustain global competitiveness. There has been a lot of speculation about the reason for the change. The official line is that the show is 'going back to its roots as an industry trade event'. However, the 2018 public airshow drew a lot of criticism for its lacklustre line-up and loss of dynamism from the displays, including the Red Arrows. The proximity of residential areas and the safety regulations, especially following the Shoreham incident, had limited the Red Arrows and other teams to fly-bys, depriving the event of much of its excitement. There were highlights, especially a rare appearance by a Spanish Navy Harrier and displays by several aircraft from the Flying Bulls, including their Bristol 171 Sycamore and Lockheed P-38 Lightning, but the highlights were too few and the price of entry too high to satisfy a large proportion of the visitors. Following the 2018 airshow the organisers accepted that there was a need for a review, invited observations and said they would revise their approach to the 2020 Farnborough International Airshow in the light of comments received. This, it seems, is the outcome. Disappointing for many, unsurprising for most, and possibly inevitable when the 2018 Farnborough Airshow is compared with the content and cost of the Royal International Air Tattoo, not far down the road, where the displays are more varied, more dynamic and greater in number and all for roughly the same ticket price. The first five days of the biennial Farnborough International Airshow are a trade show, when the wares of around 600 major and smaller manufacturers of aircraft and related supplies are displayed, sold and bought. The last of those days, Friday, is "Futures Day" when youngsters are given every opportunity to become enthused by aviation and other STEM interests. At the weekend the airport is opened up to the public for a traditional airshow. 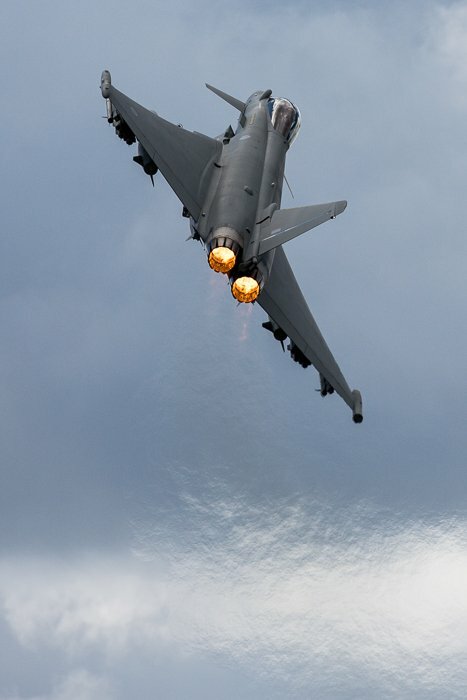 Futures Day at the Farnborough International Airshow is designed to stimulate and encourage young people aged 11 – 21 into an exciting career in the dynamic sectors of aerospace and defence. Held on the Friday of show week, groups from schools, colleges and universities are able to visit the Farnborough International. The UK Space Agency is participating in Futures Day which is also supported by the aerospace industry and STEM institutions, ensuring an informative and engaging day. Amongst the novel exhibits in 2018 was Richard Browning, flying above the runway over the public weekend using a lightweight 'Gravity Jet Suit', described as 'a miniature Harrier aircraft' with small jet engines mounted on each arm and behind his back. More displays to encourage STEM (science, technology, engineering and mathematics) were brought to the show by the Winchester Science Centre, including its mobile planetarium, the largest standalone planetarium in the UK. The weekend flying displays featured a demonstration by two pilots from the Red Bull Air Race. Flying Edge 540 raceplanes, Italian pilot Dario Costa and the UK‘s own Ben Murphy, former Red Arrow and former member of the Blades aerobatic team, reached speeds of 370kmh as they flew around an aerial racetrack, marked out with 25-meter-high inflated plastic pylons. This was the only chance to see Red Bull Air Race aircraft in the UK this year. 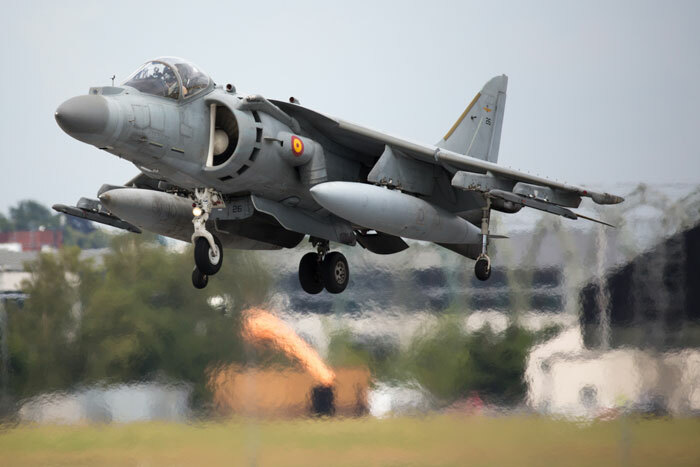 Novel though that was, a much greater highlight for many again this year was the Harrier from the Spanish Navy and a fleet of Flying Bulls fixed wing and rotary aircraft, not often seen at British Airshows. 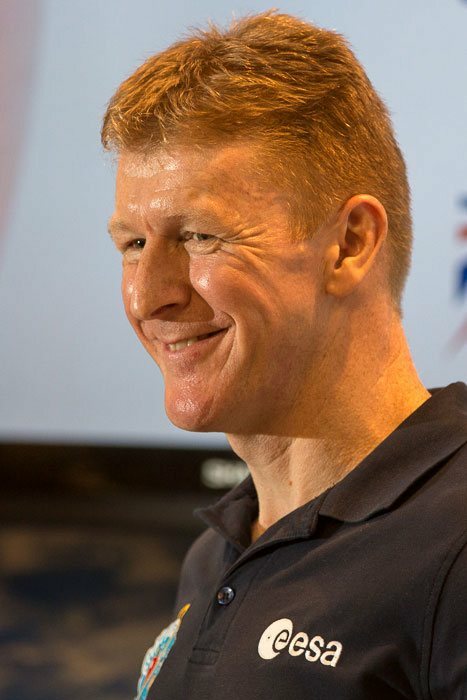 Hugely popular at the Farnborough Airshow 2018, Tim Peake returned to the Farnborough International Airshow in 2018. He arrived on Friday, Futures Day, and participated in a programme of events especially designed to inspire young people from school, colleges and universities. He talked at length to students about working in the space sector and his personal experience of becoming an astronaut of the European Space Agency and his mission to the International Space Station in 2015/2016. 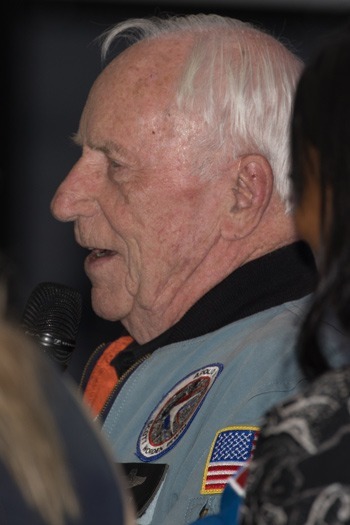 Joining him on stage on Friday was Al Worden, Command Module pilot of Apollo 15. Farnborough Airshow, the biggest trade airshow in the UK, is held once every two years. It lasts for a whole week. The first four days, Monday - Thursday, are trade days when £billions of international business is transacted. Friday is 'Futures Day' when youngsters are encouraged to attend and learn about aviation and associated sciences. At the weekend it becomes a public airshow. In 2016 the show hosted the second appearance in the UK of the F-35 Lightning II jet, following its début at RIAT. The US Marines Corps brought two F-35B jets, the US Airforce two F-35As and one British F-35 came to the UK for displays, but only the F-35B was seen at Farnborough. One of them performed a flypast with the Red Arrows when the show was opened by the Prime Minister at 10.30 on Monday 11th. The mixed flypast with the Red Arrows was not repeated during the week but the F-35 did display over the public weekend, including the Friday's 'Futures Day'. As well as the flypast with the F-35B to open the show, the Red Arrows flew with the Airbus A350 and twice with the Airbus A400M. They also parked up very close to the Grandstand over the public weekend and interacted with the crowds who could chat with them and the 'Blues' and see at close quarters the preparations for flight. On Friday and Saturday they also made a flypast break to land, but on Sunday they flew direct from their Flypast with the A400M back to Scampton. Some in the crowd had not realised, despite the publicity, that the Red Arrows would not be making a full display, and seemed somewhat disappointed that the displays had been reduced to flypast only. Although the mixed flypasts with Airbus aircraft were welcome, it was a little surprising that they had not made more than one flypast on each day. The reasons for the lack of the dynamic part of the show were understandable in the post-Shoreham caution but perhaps a few formations from part one of their normal display could have been offered to the substantial numbers who came from the exhibition areas to the crowd line especially to see them fly. Weather was certainly the topic on the opening day, when flights had to be cancelled early, and the showground closed down, because of torrential rain, flooding and water ingress to several buildings, which affected the electrical circuits, causing the power to be turned off. A huge effort over Monday night, including not only water clearance but necessary repairs and even carpet renewal, meant that the show was ready for business on Tuesday although there was further rain both then and on Wednesday, including a lightning strike close to the commentary position. Thursday was the first all-dry day but Friday returned to low cloud by airshow time and then rain stopped the displays again just after 16.00. On Saturday and Sunday the cloud threatened but the rain stayed away. As well as the F-35 and the Red Arrows, weekend highlights included a phenomenal display by Rich Goodwin, complete with colourful pyrotechnics and the BAe Typhoon (not the RAF one). Another highlight for classic aircraft fans was the first display away from its home at the Shuttleworth Collection's Old Warden airfield since its restoration in 2014, of the De Havilland DH.88 Comet, a striking red inter-war racer that won 1934 England to Australia Air Race, for which it was designed, in 70 hours and 54 minutes. 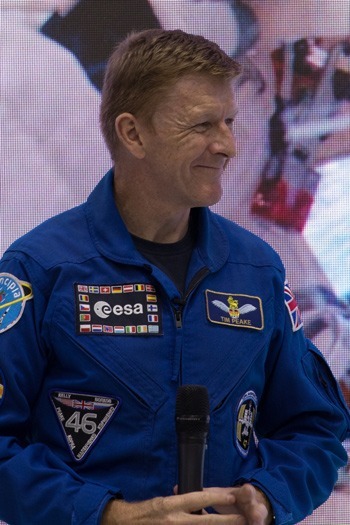 On Friday, astronaut Tim Peake was on the platform to talk to visitors and on the stage in the Space Zone to open Futures Day and answer questions from children. These were his first public appearances since returning from space. He was back on the Live Stage on Saturday and mixed very freely with the crowds seeking his autograph. On Friday there were due to be 2 mixed flypasts. The Red Arrows flew with the Airbus A350 as planned but The Blades flying with with the Oil Spill Response 727 was one of the weather casualties. On Saturday and Sunday The Blades did complete their flypast with the 727 and the Red Arrows flew with the Airbus 400M. For the first time in 2016, the UK Drone Show was held alongside the Farnborough Airshow. The latest drones and drone technology were on show to airshow visitors. There was a focus on the safe use of drones, careers in the drone industry and CAA drone regulations. As always at Farnborough, products were on display and there were presentations, exhibitions and speakers to further knowledge and awareness of this rising technology, hobby and business. Bronco (cancelled Saturday because time ran out. Flew Sunday). The British Army Balloon School was established at Farnborough in 1905 and on 5th October 1908 the UK's first powered flight was made here by Samuel Cody in 'British Army Aeroplane No 1'. The airfield has been involved in aviation ever since, making it the first and the longest-established active airfield in the UK. The airfield was owned and operated by the British Ministry of Defence (MOD) throughout the two World Wars and the Cold War, being used for flights, manufacturing and research & development. It was eventually declared surplus to military requirements in 1991. TAG Aviation took over the running of the airport under contract in 1997. Under the brand TAG Farnborough Airport Ltd they have since taken over the freehold of the estate which, as well as remaining an operational airport, has become a centre of business aviation and home to some of the UK's largest aviation businesses as well as the Air Accident Investigation Branch of the Department of Transport. Farnborough Airport is on the A325. There are signposted routes from the M3 and the A31. Use sat nav GU14 6FD to get near but ignore the sat nav in favour of the show direction signs as soon as you pick them up. There is very little reserved parking on the airport itself. The vast majority of drivers, including everyone who has not reserved a space, will be directed to an off-site free car park with a free shuttle bus to the airport. The National Express coach service between Fareham and London passes through Farnborough and also visits Southsea, Portsmouth, Petersfield, Farnham and Aldershot. There may be special services to the show. See the show's 'getting there' page and local coach service providers for any details. The Gatwick to Farnham train passes through several stations very close to the show: the nearest is North Camp. There is a free shuttle bus between Farnborough Main, Aldershot and North Camp stations and the show. Click the blue Expedia name for a list of hotels and guest houses near the show. The venue is already built into the link but when the list comes up you do have to enter your dates and, if necessary, change the number of rooms and people staying. Although there is a Holiday Inn in Farnborough, you are most unlikely to get a room during the airshow. The International Hotels Group also have a Holiday Inn in Guildford, about 11 miles away and two in Reading, slightly further out. Premier Inn have two hotels much closer, one at Farnborough West and one at Aldershot, both within three miles of the show, and another three at Fleet, Sandhurst and Bagshot, all between four and seven miles from Farnborough.